I've received a couple of questions recently about how to install a crown. This is definitely a do-it-yourself project if you have the basic tools that are required. a small screwdriver, probably .70mm would be fine. Let me show you how to go about it. In the photo's below is a typical project watch. This one is a 1955 Murray. The gold filled crown has worn along the circumference so the disc-shaped cover has actually fallen away, leaving bare brass showing. 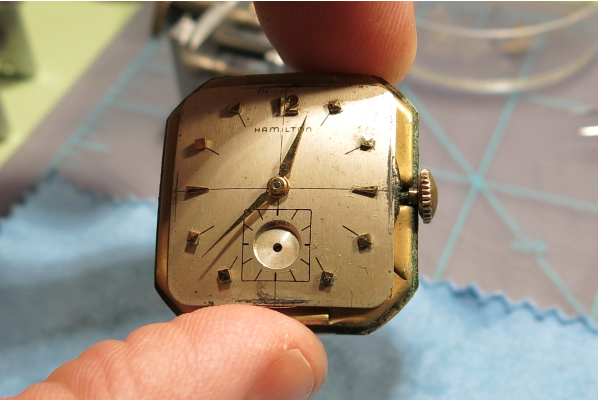 A new crown would be an important element to this watch's restoration. The first thing to do is to pop the bezel off the case back. 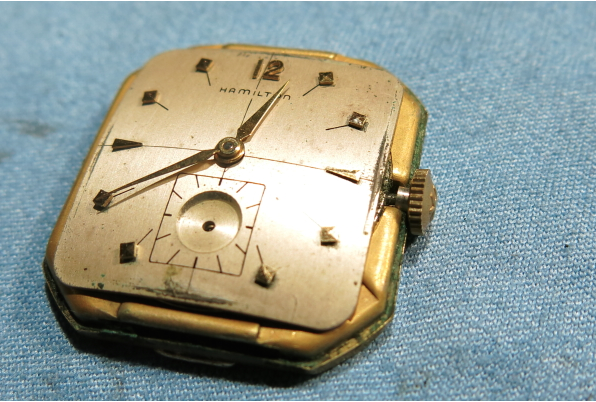 This model has a two-piece case and the movement is retained in the case back. Sometimes the movement is held in the bezel. Regardless, you need to separate the front from the back. 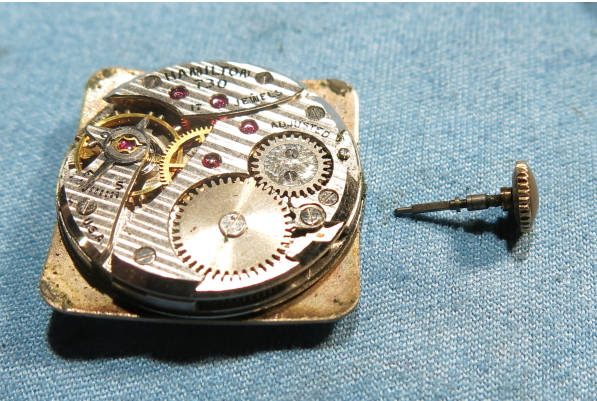 When you have a three-piece case the movement is retained in the center and you'd only have to take the case back off. 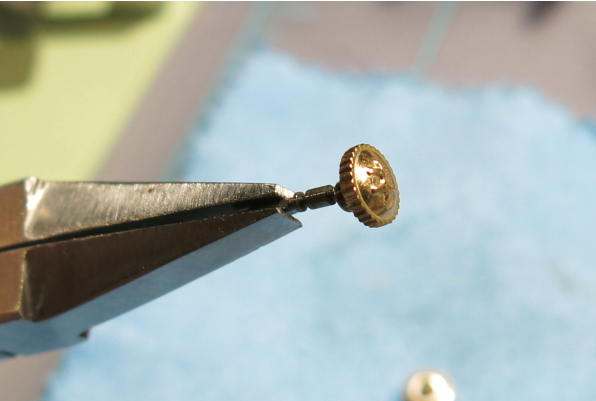 Since the movement is inside the case back, a small screwdriver can be inserted under the dial and the movement gently lifted up and out of the case. 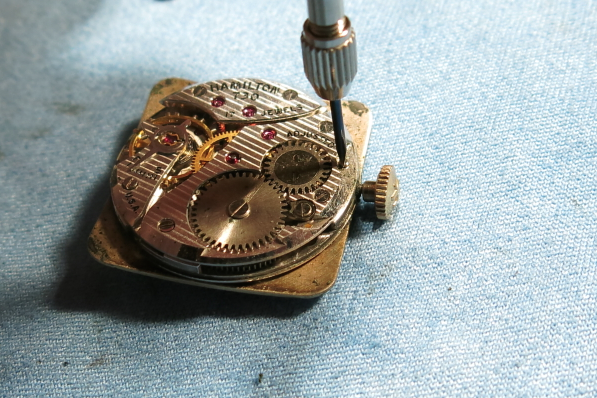 Anytime the movement is outside the case you have to be VERY CAREFUL not to damage the balance wheel. Take great care not to drop the movement as it is very easily broken. 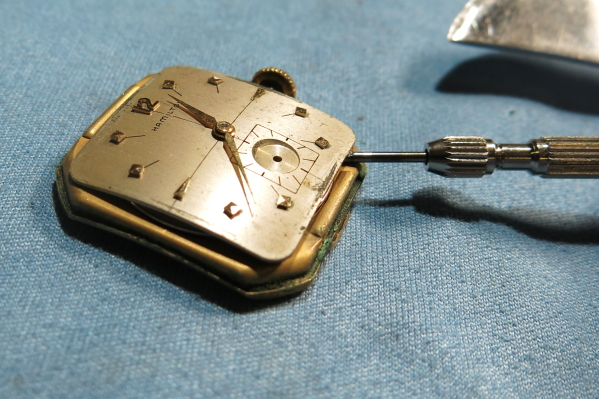 If you don't have a movement holder you can gently place the movement dial down on a piece of soft cloth. 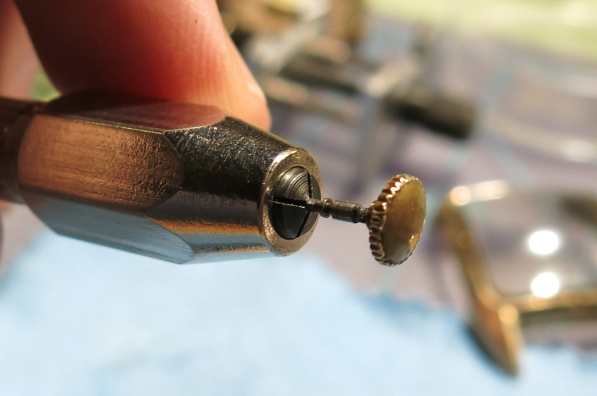 With the .70 mm screwdriver, you must turn the "set lever screw" counter-clockwise about 2 turns... maybe slightly more. The set lever screw is usually the smallest screw you see nearest where the stem enters the movement. Loosening it will back off the set lever from the stem and allow you to pull the crown out (like you're setting the time) and the crown and stem will come out of the movement. It's the set lever that holds the stem in the movement. 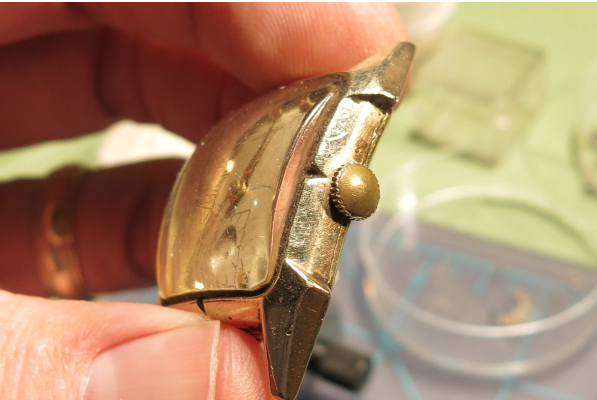 If you ever experience getting a "new" vintage watch and the stem and crown come out when you try to set the time - it probably just needs to have the set lever screw tightened. Although it's possible the set lever needs to be replaced. If the stem doesn't come out, push it back in to the winding position and turn the set lever screw 1/2 turn more (counter clockwise) and pull the crown out again. 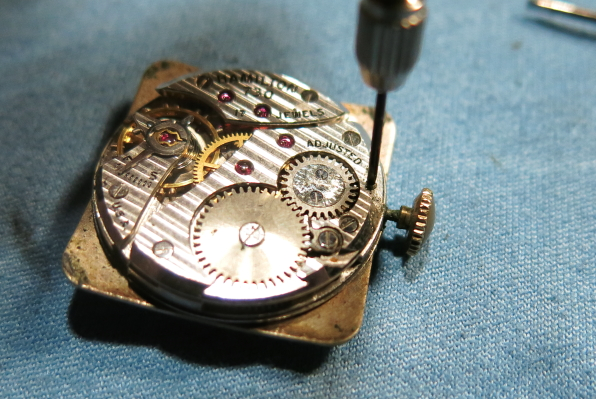 Now the crown and stem are removed from the movement. At this point you should grip the square portion of the stem in a pin vice so you can hold it firmly. The stem is quite small, as you can see relative to my finger tip. Or you can hold it firmly with flat pliers. 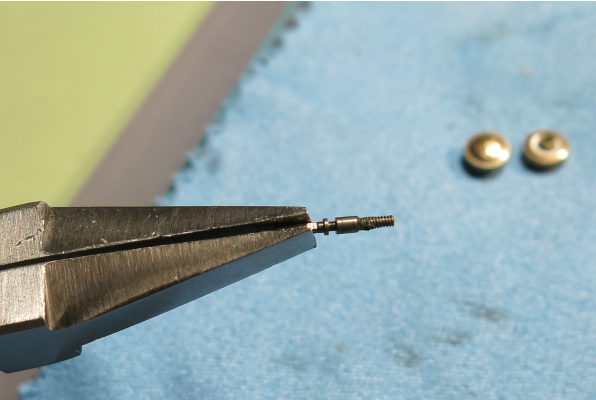 You do not want to mare the square portion of the stem so avoid pliers with a serrated surface. With your finger tips, turn the crown counter-clockwise while holding the stem firmly and the crown will unscrew off the stem. The threaded portion of the stem has a specific male thread size and the new crown has to have the same female threads. 6/0 and 14/0 size Hamiltons are Tap 8. 8/0 and 12/0 Hamiltons are Tap 10. Most of the Swiss Hamiltons are also Tap 10 (I believe - I could be wrong but I'm pretty sure they're Tap 10 and not Tap 9). 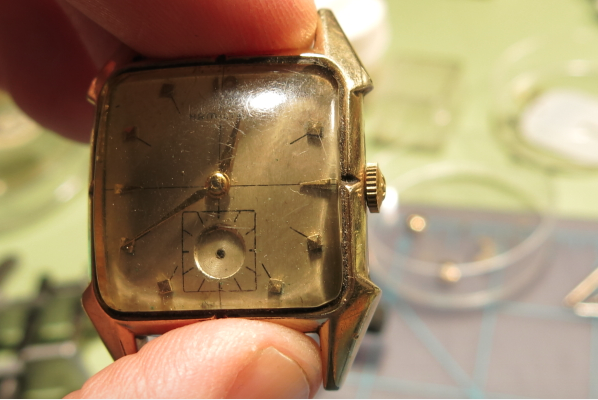 Anyway, my project watch is an 8/0 sized 730 and it takes a Tap 10 crown. Just screw it back on the stem in a clockwise direction until it's "finger tight". 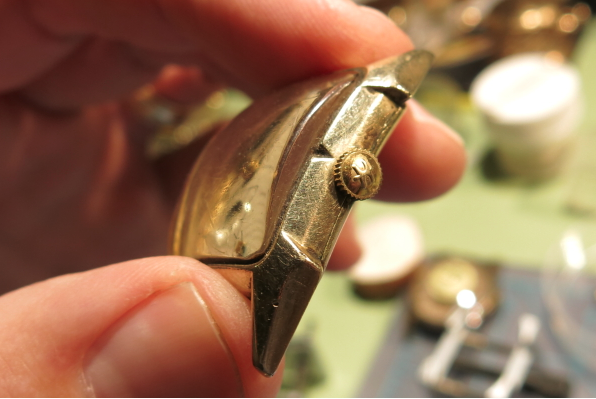 Then you slide it back into the movement by carefully aligning the square portion of the stem with clutch inside. When it's aligned correctly it will slide right in. Once it's fully seated you should be able to wind the watch. 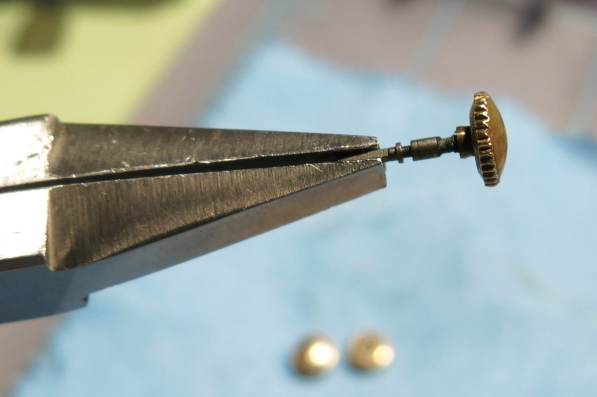 Then tighten the set lever screw clockwise until it stops turning. Now when you pull the crown out the watch should go into time setting position. At this point the crown has been changed. Sometimes the new crown doesn't seat as far on the stem as the old one and it ends up sticking too far out of the case. When that happens you need to shorten the stem slightly by gripping it in a pin vise and rubbing the threaded end on 600 grit sand paper until it's the right length. If the new crown seats too far down the stem, the stem might now be too short and go into the setting position when you install it into the case back. When that's the case, you'll need to install a new stem too. You already know how to do that... you just need to be able to shorten the threaded section to the correct length. In the case of this Murray - it was a perfect fit. Here's the new crown on the outside of this still pretty rough looking Murray case. This crown has the Hamilton H logo. And as you can see, it's a perfect fit. What is your preferred method for polishing cases and removing verdigris? Simichrome and a clean cloth are good for polishing cases. Verdigris is tough to remove but I after I polish a case I put it in my used watch cleaning solution and rinse. That will typically make everything clean and bright. What a Difference a Dial Makes!